The baby grand was the center piece of our living room in Keeseville. For our family, three of the best gifts we ever received were an ugly orange spinet, a mahogany baby grand, and a walnut Yamaha upright. After the war, my parents and my two older siblings moved from New London, Connecticut, to Potsdam, New York, so that my father could help my Uncle Eli, my mother’s brother, with his clothing business. Housing was very difficult to find in 1948, and my parents were left no option but to purchase a very small ranch on top of a very windy hill. Cramming the four of them into the two-bedroom house was difficult enough. When I arrived in 1950, things got even more crowded. The kitchen was so small that the person sitting in the kitchen chair nearest to the refrigerator would have to stand up if someone had to grab the milk. Laura and Jay shared a bedroom, and my crib was sandwiched into my parents’ bedroom. The tiny living room had a couch, two chairs, my playpen, toys, books, and, in time, a very ugly piano that was one of my sister’s best gifts. Potsdam was not only the home of the state college but also the location of the Crane School of Music, which provided many musical opportunities to the community. My sister walked past Crane on her way home from school every day and heard the students practicing their instruments. Intrigued and inspired, she asked my parents for a piano. After proving herself by taking lessons using the neighbor’s rickety spinet, she got her wish. My parents purchased an old upright painted a hideous butterscotch orange that barely fit into the already full living room. The tiny house often reverberated with music, especially when friends gathered around the piano. My Uncle Eli, who could not read music, played any requested song by ear, so he often was on the piano bench. In 1952, my father took a job in Keeseville, New York, managing a Pearl’s department store one of several in a chain owned by my great-uncle Paul. In order to save money, my parents hired a couple of men from Pearl’s to pack up the household belongings into the company truck and deliver them safely to Keeseville. Unfortunately, the men dropped the piano while unloading it. The piano, never in tune to start, was now hopelessly flat and sported several non-functional keys. That didn’t stop us from playing. My older siblings and I took lessons with varying degrees of mediocrity. We mixed our John Thompson piano lesson books with more popular sheet music, including such Fifties hits as “Stranger on the Shore” and “Mack the Knife.” My sister’s and my favorites were from the American Songbook. We had a healthy collection of Rodgers and Hammerstein, Cole Porter, and George Gershwin. By the age of twelve, I had gone through a couple of piano teachers, one who retired and one who moved away. Despite the lack of lessons, talent, and a decent instrument, I still loved to play. I alternated between the classical music I learned from my former teachers and all the music my sister had left behind when she went to college. I began lobbying for a new piano. I knew, however, that getting even another second-hand one that was in a little better shape than our orange relic was probably out of financial reach for our family. One evening before Chanukah in 1962, my parents called me into the kitchen. That afternoon, my father found out one of his customers was moving to a smaller home and was selling a used baby grand for only five hundred dollars. Was my father was interested? Yes, I was, in fact, getting my wish. I cried for joy, even more so when the beautiful instrument with its shiny mahogany finish was delivered later that week. Unlike our tiny box of a house in Potsdam, our Victorian house in Keeseville had enough room for the baby grand. With a minimal rearrangement of furniture, the piano became the centerpiece of our living room. The piano again became a gathering place for family and friends. I often played while my siblings sang along. My brother even joined in with his trombone. I missed lots of the notes, my sisters were not known for their vocal talents, and my brother was no Urbie Green, but we loved the chance to be together. My Grandpa Joe played Yiddish songs after he moved in with us after my grandmother’s passing in 1966. Uncle Eli got to hammer out his share of songs when he visited us from Potsdam. Once I left for college, I played infrequently, mostly on school breaks. When my parents moved out of their big house in Keeseville in 1982, the piano was sold as none of the children had room for it in their homes. Before my parents downsized, however, I collected all the sheet music from the house and stored it in our home “just in case” we ever got a piano. I had little chance to play—until I received my second best gift ever. After my daughter Julie was born, I was home with the two small children. The days were getting long. 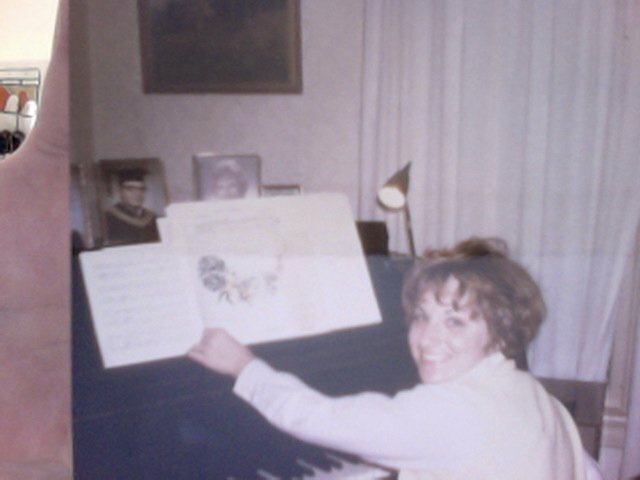 Knowing how much I loved my baby grand in Keeseville, Larry encouraged me to look for one that would fit into our home. The Yamaha upright I selected from Clark Music in Latham was delivered two weeks before my thirty-second birthday. Armed with all the sheet music my family and I had accumulated since my sister started lessons in Potsdam many years before. I spent many hours playing the piano, both for enjoyment and for the peace and serenity playing gave me. When she was a junior in high school, Julie decided to take piano lessons for the first time. I felt my musical life had come full circle when my daughter’s teacher recommended we purchase new, unmarked John Thompson lesson books. At her first and only piano recital, Julie choose Pachabel’s Canon and my old favorite, Moon River. When Larry and I decided to move to Florida, I initially thought of selling the piano. It was expensive to ship to Kissimmee; I didn’t play that often; I could always use the piano in the Palms, the community center a mile from our house. It was Larry who insisted that we pay the moving company to bring the piano with the rest of our household. There was no repeat of the Potsdam debacle. The piano arrived safely in our new home. We placed it on an empty wall in the living room. From the moment I first touched the keys, I knew Larry was right. The tile floors and open floor plan improved the sound quality over that produced in our bi-level in Clifton Park. Soon after we moved in, I had three couples over for a Shabbat dinner. After dessert, my friend Becky, who taught music in high schools for many years, started looking at my sheet music collection. “This is fabulous!” she commented. “Please play for us!” Not used to an audience, I played hesitantly for a few songs,then Becky graciously took over the keyboard. For the next hour, we belted out songs from Les Mis and Wicked as well as my old favorites, “Sunrise, Sunset” and “Moon River.” I had tears running down my cheeks from happiness. Thanks to my piano, our new home was filled with the sound of music. This entry was posted in Family Stories on April 20, 2014 by shapcomp18.